The Friends of El Paso County Nature Centers is a 501(c) 3 nonprofit whose mission is to support Bear Creek and Fountain Creek Nature Centers. The organization is comprised of an executive board of elected officers and a general membership governed by official Bylaws and Articles of Incorporation as a 501-c-3 nonprofit organization. For more than 30 years the Friends Organization has provided volunteer hours and funds to support outstanding interpretive programs and services to El Paso County residents. Become a member and you play an important role in ensuring a strong future for the nature centers. Your membership will provide advocacy for stewardship, education, and outdoor recreation and you will receive special member benefits. One choice with membership is to become an interpretive volunteer. These volunteers support El Paso County Parks by serving as information receptionists at nature centers, leading interpretive programs, participating in special events, conducting community outreach programs, and engaging in special projects. Active members must complete interpretive volunteer training and contribute a minimum of 40 hours of volunteer service annually. Learn more about volunteer opportunities by contacting the volunteer consultant at 719-520-6387 or bcfcvolunteers@gmail.com. 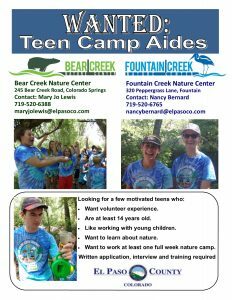 Teens who are looking for volunteer opportunities can find several volunteer positions at the nature centers. Some volunteer opportunities have flexible time commitments while others are very specific. Opportunities include junior camp counselor, program assistant, trail maintenance, and more! Contact the Nature Center Supervisors to find out more! Bear Creek Supervisor Mary Jo Lewis – maryjolewis@elpasoco.com; Fountain Creek Supervisor Nancy Bernard – nancybernard@elpasoco.com. to give their time to El Paso County Nature Centers.